My thoughts are with the people of Christchurch and surrounds, after another devastating earthquake hit the city and region early Tuesday afternoon (22 Feb) , New Zealand time. Measuring 6.3 on the Richter scale, the quake was not as strong as last year’s big earthquake, but was centered much closer to the city and was closer to the surface of the Earth. At least 65 people are reported dead with the Christchurch Mayor warning that the death toll will rise. As many as 200 hundred are thought to be trapped under fallen buildings. Rescue efforts are continuing overnight and into tomorrow, with additional teams being flown in from around the country and overseas. As I have relatives living in Christchurch, and grew–up in the city, I was shocked to hear the news and spent a few worried hours before being able to get in touch via text message; all are safe. Understandably, telecommunication services have been overloaded and some down, so authorities have been asking people to communicate via text message whenever possible. 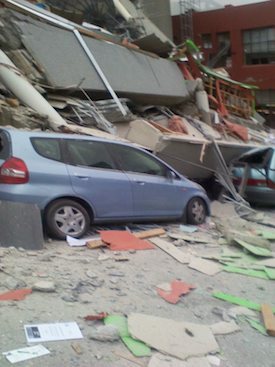 My heart goes out to all those impacted by the massive quake, and to those involved in the rescue efforts. I’m sure it will be a difficult night for all those in Christchurch, especially with significant aftershocks continuing to rock the region, as they have since the last year’s quake. Here are a couple of videos taken by people on the ground today. The first incredible video, Live earthquake in Christchurch, (embedding disabled on this one) is shot in Sumner, a beach suburb of Christchurch, where massive boulders were tumbling from the steep cliffs. On a lighter note, and we tend to need at least a touch of humor in these situations, the embedded video features a good-spirited kiwi bloke, Graham, attempting to alert his friend Don of “a @!#*ing river flowing down the middle of Don’s bloody driveway”. Stay safe Christchurch, and good luck for the days ahead. You deserve it after the horrendous 6 months you’ve been through.